Sen. Bernie Sanders (I-Vt.) speaks in Burlington on election night. Updated 11/11/14, 11:30 a.m. with information about Devine's support for Sanders' campaign. Since the midterm election, national journos have lost no time in turning their sights — and their speculation — to the contenders for the 2016 presidential election. And though Vermont’s Senator Bernie Sanders (I-Vt.) hasn’t said whether he’ll run, it’s looking likely: High-profile Democratic strategist Tad Devine will jump aboard Sanders' campaign, according to the Washington Post. Tuesday’s Washington Post features an interview with Devine, a prominent Democratic Party consultant who’s worked on the Al Gore, John Kerry and Michael Dukakis campaigns and who has also worked on Sanders' campaigns. 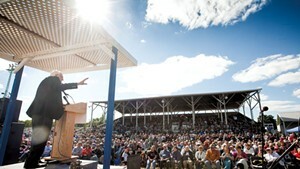 Devine pointed to Sanders’ grassroots popularity and his high profile in the national media as strengths going into a 2016 campaign. Devine's support signals that Sanders' not-yet-declared 2016 presidential campaign is likely moving forward. 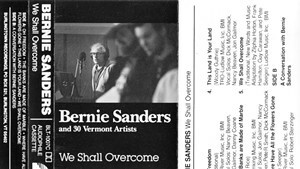 Sanders also scored a mention in both the New Yorker and the New York Times recently. The Senate’s lone socialist has been coy on whether he’ll run for president, but his regular trips to early primary states and statements to the press have become far more frank in the past few months. The New York Times named the junior senator as one of three possible candidates for the Democratic nomination, alongside former secretary of state Hillary Rodham Clinton and Maryland Governor Martin O’Malley. Mr. Sanders almost certainly would not pose a threat to Mrs. Clinton, but his presence in the race may push the debate more toward the questions about economic fairness that have been his signature in public office. Mr. Sanders also could fill the role of the candidate nudging Mrs. Clinton to embrace a more populist approach. In the New Yorker, Ryan Lizza looked at Hillary Clinton's "inevitability trap" and at the alternate candidates waiting in the wings for her to make a misstep. Clinton is the presumed frontrunner for the Dems' next presidential nomination, but if history is any guide, at least one other viable contender will emerge from obscurity to put up a stiff challenge between now and the fall of 2016. Lizza offered a meditation from former Vermont governor Howard Dean on being a dark-horse opponent. Dean told the Times he discovered during his 2004 bid for the Democratic nomination that it was impossible to hold momentum with the left wing of the party, which had pushed him to popularity, while courting the middle-of-the-road voters as well. “The problem with running against somebody like Hillary ... is that, when you make the turn, then you disappoint all your followers,” he said. 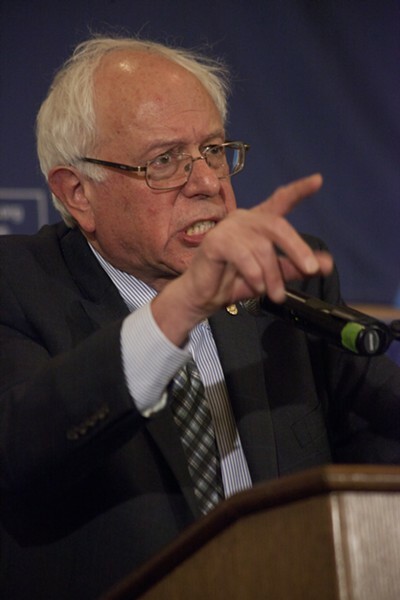 Lizza named Sanders as one of three possible Clinton opponents — O'Malley and former Virginia senator Jim Webb were also in the mix — but described Sanders as “the Democratic Party’s Ron Paul.” As in Paul's 2012 bid for the Republican presidential nomination, Lizza wrote, Sanders' chance to win would be tiny: “His presence in the race and his passion about a few key issues would expose vulnerabilities in the frontrunner’s record and policies, as Paul did with John McCain and Mitt Romney," Lizza wrote. Sanders told Lizza his campaign wouldn’t exist solely to call into question the actions and policies of the other candidates. “If I run, I certainly would run to win,” he said. After all, he’s already got a campaign anthem.